Launched on May 1st 2015 you can now become a PADI Wreck Detective with the new distinctive speciality written by the Nautical Archaeology Society, to help you enjoy wreck dives even more. Have you ever sat on the boat after a dive and felt like you must have been swimming round a different site to everyone else? Do you struggle to work out the bow from the stern, never mind all of the features in between? If so then this is the course for you. Becoming a Wreck Detective will open your eyes to the common features found on both metal and wooden shipwrecks, key identifiers to look out for and what to do next if you would like to find out more about a particular wreck site. The course is ideal for anyone who is interested in wrecks but doesn't wanted to go inside one or be in an overhead environment. Discovery is just the beginning, by the end of this course you will have the skills to identify what kind of shipwreck you are investigating and will be able to recognise some of its key features. Diving on wrecks appeals to most divers and whether it is your first or your hundredth dive on a wreck, the dive will be a challenge as you investigate what it is you are looking at. Wrecks are historic time capsules that are just waiting to be explored and their story unravelled. 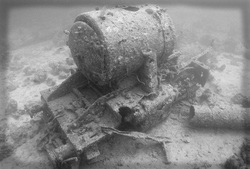 Wrecks can be a range of sites from ships to aircraft, cars, trains and even tanks. These sites will range from those open to novice explorers to those which are only accessible by the most experienced technical divers. 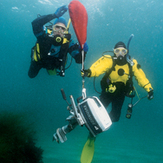 The goal of this course is to teach student divers to become Wreck Detectives. 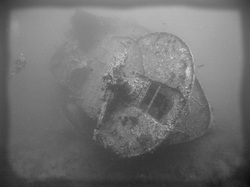 By exploring and understanding the wreck sites that divers love to visit, student divers will develop their knowledge and techniques involved in investigating a wreck site while diving within recreational limits. While this course focuses on the wrecks divers visit students should also be aware of the marine life that lives on and around these sites. 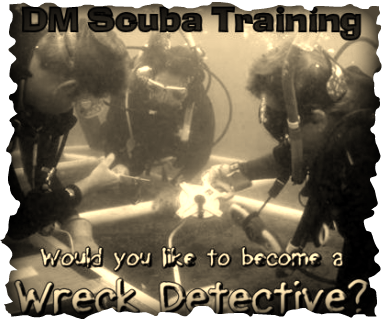 The best way to learn how to become a Wreck Detective is by doing it. 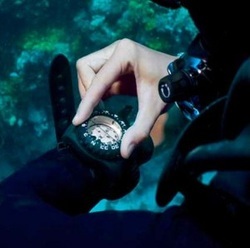 This course philosophy therefore, expands student diver knowledge about wreck sites, limitations and laws, key features of wreck sites, diving equipment required and what to do with the information you collect. Student divers will apply the knowledge they gain by reading the Wreck Detective Student Manual and on two open water dives practicing and demonstrating the practical aspects of this course. 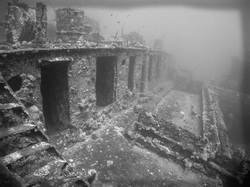 Many shipwrecks are often found in deeper water. That’s why the NAS Wreck Detective course is a natural companion to the PADI Wreck Diver and PADI Deep Diver course. Other training to consider is the PADI Enriched Air Diver course to extend your bottom time or the PADI Boat Diver course on your way to PADI Master Scuba Diver. Wreck training dives are limited to within the light zone and within 40 metres/130 feet from the surface, vertical and horizontal distance included. If you have a preference for the wreck we use for training and it's located in deep water (over 18 metres/60 feet), the Deep Diver rating is recommended as a prerequisite for the Wreck Diver programme. Normally we head out on a boat from Portland harbour in Dorset diving on a real wreck. But if the weather is against us the course will be held at an inland dive site. *Includes boat fees, boat prices can change so please check with us first. Learn how to search and recover properly - Click on the photo to learn more!